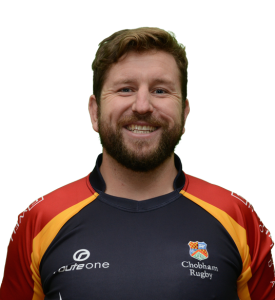 CHOBHAM RFC will be hoping to emulate their last success in the Incentive FM Surrey Trophy to progress through to the final of this year’s competition, writes Andy Fitzsimons. Chobham RFC coach: Ryan Gregory. With the Chob lying in mid-table obscurity in the London 1 South, player-coach Ryan Gregory believes there’s no better time than the present to win some silverware to truly celebrate the club’s 50th year anniversary. The last time Chobham played in the Trophy was several years ago when they beat Sutton & Epsom 26-20 in final. Now the club wants to take a trip back down memory lane when they entertain arch-rivals Camberley in the semi-final on Saturday (18 March ’17). Despite having home advantage, Gregory and his players are under no illusion of the task ahead and the threat that Camberley pose. While neither side have played each other in a competitive league game for a number of years, the rivallary is still prevalent; irrespective of whether Camberley play in a lower status London 2 South West division. He said: “We haven’t played Camberley in a competitive fixture for a good few years now, but they’re flying in their league and are pushing for promotion back to the London 1 South. “They’re a very young side, and play an exciting attacking brand of rugby. They play with a lot of confidence and have scored a lot of points this season, which why there are where they are. “If to add into the mix that it’s a local derby too, you can see there’s plenty at stake,” he added. With the potential of an upset on the cards, Gregory is rightfully not prepared to get into any pre-match mind games and predictions, and remains focused on the job in hand. “It was important for us to get a win against Maidstone last Saturday (11 March ’17), especially after our second half performance against Tunbridge Wells the previous week,” explained Gregory. “We know that Camberley will be well drilled and will look to come at us. Therefore, I am treating this Saturday’s Trophy match in much the same way as I would condition the players for any other London 1 South league game. “Everyone is aware of what happened when we played Camberley in a pre-season friendly back in August, so neither I or any of the players will be complacent; quite the contrary. “I believe that if we are able to keep the ball for long periods of time, which I know we can, we will win, but it certainly wont be easy,” added Gregory. The winner of Saturday’s semi-final will play one of Battersea Ironsides or Old Reigatian in the final, which is due to take place on 1 May 2017 at Esher Rugby Club.